Well, this is a first: I’m more enthusiastic about the front matter of a book than its contents. (This is not a slam on the stories in the book; it’s just a comment regarding how much I enjoyed Brin’s introductory essay.) More often than not, I skip the front matter, especially in sci-fi books, but in this case the title of Brin’s preface, “The Heresy of Science Fiction,” hooked me. As I read it, I found myself repeatedly muttering “Yes!” as Brin made one cogent point after another. By far dominant in nearly all human societies has been a Look Back attitude . . . a nostalgic belief that the past contained at least one shining moment — or Golden Age — when people and their endeavors were better than today. . . . You find this thim in everything from the Bible to Tolkien to Crichton — a dour reflex that views change as synonymous with deterioration. The grouchiness of grandpas who proclaim that everything — even folks — had been finer in the past. Compare this attitude to the uppity Look Ahead zeitgeist: That humanity is on a rough and difficult, but ultimately rewarding upward path. That past utopias were fables. That any utopias lie ahead of us, to be achieved . . .
[Science fiction] retains this notion. That it is possible — perhaps just barely — that our brightest days may lie ahead. Indeed, that is science fiction’s greatest trait, distinguishing it from almost all others genres. . . . The new type of [science fiction] tragedy — a cautionary tale — may change your future decisions. . . . As millions who read Nineteen Eighty-Four vowed to fight Big Brother, and other millions who watched Soylent Green became fervent environmentalists. In contrast, what is the implicit assumption in most fantasy tales, novels and films? Apparently, the form of government that ruled most human societies since the discovery of grain must always govern us. Royalty and lordly families. Priestly castes and solitary, secret, mages . . . the roll call of standarde characters going back at least four thousand years. . . . But for all the courage and heroism shown by fantasy characters . . . what has happened by the end of these stories? Good may have triumphed over evil and the land’s people may be happier under Aragorn than they would have been under Sauron. But “under” is their only choice. It would be easy to quote further illuminating passages, but I won’t — go out, buy this book, and read Brin’s essay. 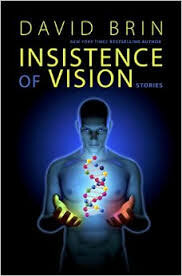 The stories in Insistence of Vision cover a wide range chronologically, in form, and in subject matter. One commonality in almost all of them, though, is that they’re intended to make the reader think, not just put his or her mind in neutral and enjoy a good but pointless tale (such sci-fi tales being all too common). Regarding content, the stories range from a claustrophobic tale of undersea dwellers surviving an alien invasion (“The Tumbledown of Cleopatra Abyss”), to a more optimistic “mash-up” (a cringe-inducing term, best avoided) retelling of War of the Worlds written in the style of Jules Verne. To an overtly political story about resistance to illegitimate authority, “Eloquent Elepents Pine Away for the Moon’s Crystal Forests.” As with almost all short story collections, the quality of the stories varies from high points such as “Eloquent Elepants” to a few others which could have been omitted with no loss, such as the cautionary tale about Von Neumann machines — a topic beaten to death decades ago. But the high points are very real. Fans of Brin’s Uplift trilogies will be overjoyed that Brin has returned to that “universe” with a new novella, “The Other Side of the Hill,” that takes up where the final book of the second trilogy leaves off. In his comments following the piece, Brin hints that there’s more to come. One can only hope so. Another strange feature is that there’s no list near the front of the book of where and when the stories originally appeared. This is a minor oddity, but it is odd. Still, all things considered, I haven’t enjoyed a book of short stories by a single author so much since I read Terry Bisson’s collection, TVA Baby. Zeke Teflon is the author of Free Radicals: A Novel of Utopia and Dystopia. He’s currently working on both its sequel and an unrelated sci-fi novel. A few years ago, PM Press reissued Fire on the Mountain, which first appeared in 1988. It’s one of the better alternative history novels, in that–unlike all too many–it has a lot to say about both politics and social issues, especially about race relations and racial attitudes in the U.S. 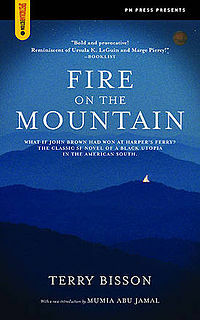 The novel’s takeoff point is John Brown’s raid on Harper’s ferry in 1859, which in Fire on the Mountain succeeds, and sparks a slave revolt in the South. The book’s main interest is in the description of the raid and subsequent revolt. Its narrator is “Dr. Abraham,” who vividly describes what he saw and took part in as a 12-year-old slave. Abraham’s first-person narrative is the strongest part of the book. It’s very believable, and the tone is spot on. Another strong point is the narration, through “letters” to his beloved, of “Thomas Hunter,” an anti-slavery white doctor who gets caught up in the revolt. Again, the tone is spot on; as well, Bisson does a remarkable job of portraying Hunter’s unconsciously racist attitudes, and how they change over time. One frustrating aspect of this portion of the book is that Bisson goes into almost no detail about the course of the revolt. The reader learns very early on that it was successful, and not much beyond that. . . . which brings us to the other portion of the book, set in 1959. At that date, there’s a successful black socialist republic, with wonders galore, in what was the U.S. South. Here, the narrative switches to third person, and follows Yasmin Odinga, a college professor and widow of a black astronaut hero, who’s traveling to Harper’s Ferry to research her husband’s ancestors. Bisson switches back and forth between passages about the revolt, narrated by Abraham, and the passages about Odinga. Unfortunately, this is where the flaws in the book become all too obvious. It’s difficult to buy Odinga’s character (she’s too idealized), and it’s difficult to care about her or any of the other 1959 characters. This is in part due to the difference between first-person and third-person narration, which is exacerbated by the “distance” in the third-person passages. This accounts for some of the problem; the rest is due to the characters existing seemingly for the sole purpose of making political points. This section of the book does have its virtues, though. One is mention of an “alternative history novel,” John Brown’s Body, which exactly follows actual events in U.S. history–and is considered a macabre horror story. As for the scientific and technological wonders of Bisson’s socialist republic, it appears that he didn’t even try for plausibility. Those marvels he mentions range from the far-fetched to the ludicrous, for instance: zeppelins (of course) for long-distance travel; a Mars program that succeeded in the early 1950s; Egyptian cars that have ceramic blocks with ceramic pistons controlled through magnetic fields(! ); and “moon shoes” that change colors and actively adapt themselves to wearers’ feet. Why Bisson chose to prominently feature these absurdities is anybody’s guess. And there’s essentially no description of the workings of Bisson’s socialist republic. There’s nothing on its political structure, and next to nothing on its economic structure; there’s not even a passage describing daily life in it. It ends up being little more than a name. If Bisson had omitted the weak, propagandistic portion of the book set in 1959 and had developed at length the section set in 1859 -1862, this could have been–probably would have been–a great book. But it isn’t. Instead, it’s a deeply flawed book that’s still well worth reading because of the gripping first-person sections and Bisson’s genuine insights into racial attitudes and race relations. Zeke Teflon is the author Free Radicals: A Novel of Utopia and Dystopia. A recent example of that is the dreadful California, which Stephen Colbert enthusiastically pushed on his show, and which was issued by a major publisher, Hachette, not coincidentally also Colbert’s publisher. (He was open about this.) The book sold tens of thousands of copies and in July reached #3 on the New York Times bestseller list. This is a somewhat special case, due to Colbert’s heavy promotion, but it’s also symptomatic of the inherent advantages held by major publishers. What creates those advantages? A number of things. First, major publishers have more money for promotion than small presses, often much more. Second, major publishers have on-staff publicists who already have good contacts with the television industry and print media. Third, almost all major publishers are based in New York City, and there’s a very real New York bias in important parts of the media. In contrast, small publishers usually have small advertising budgets, few if any contacts in major media, and have to hire outside publicists (if they can afford it–many can’t) who’ll put in nowhere near full-time work. Recent trends in the bookselling industry have only exacerbated this problem. Half a century ago, before the rise of the national chains and then Amazon, booksellers by and large were independent bookstores. Such stores routinely would order books and leave them on their shelves for a good three to six months, sometimes a year, before returning them. This ensured that books that received few if any reviews would be seen by large numbers of possible book buyers, and so would have a chance of selling well eventually due to word of mouth. Compounding matters, over the last decade or so it’s become very easy and very cheap to publish both print-on-demand (paperback) books and e-books. This has resulted in a huge increase in the number of available titles, many of which are awful. Combine this with the current predominance of online bookselling, with its near-total lack of gatekeeping, and it becomes very, very difficult for even the best small press books to rise above the noise. Then add in the tanking economy (for most people–Wall Street is doing fine), with its continuing unemployment, low-paying jobs, and declining median income (down an astounding 12% since 2001), and times are tough for small publishers and their books (which many financially stretched potential buyers regard as luxury items). Which brings us to TVA Baby. It’s one of the deserving small press books that have fallen through the cracks. It’s a collection of 13 short stories by longtime science fiction (and nonfiction) author Terry Bisson, and it covers a wide variety of topics and genres. Stories in it range from noir (“Charlie’s Angels”), to purely comic (“Billy and the Circus Girl”), to ’30s pulp sci-fi (“Brother Can You Spare a Dime?”), to sappy (“A Special Day”), to hallucinogenic (“TVA Baby”). As with nearly all short story collections, there are some hits and some misses in TVA Baby; but the ratio of hits to misses is higher here than in the average collection. So . . . . . If you enjoy concise writing and mordant humor, you’ll enjoy TVA Baby.